It was the holiday season and many family members were traveling great distances to converge on “Mom’s House”. To complicate matters even more, one family member was temporarily living with her mom as a result of being on bed rest for the duration of her high risk pregnancy. Her mother, who was a fairly active woman in her mid-70 without any health problems, was complaining about back pain. She believed she had strained a muscle but couldn’t seem to get relief. 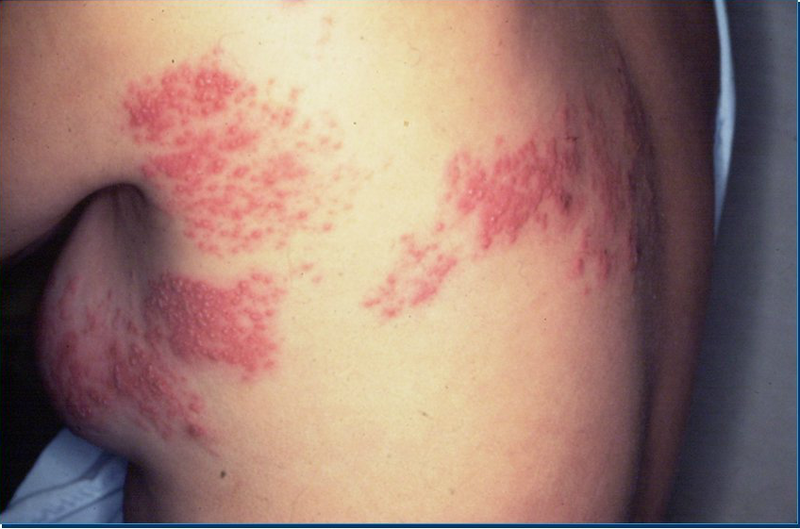 When the rash appeared a few days later, it became clear that she had shingles. It really shouldn’t have come as much of a surprise. About one of every three people in the U.S. will get shingles during their lifetime, and the risk increases with age. For immune compromised individuals, the risk of shingles increases by as much as 50 fold. In fact, every year in the U.S. approximately one million people are affected by shingles. If you’ve ever known someone who has suffered with this disease, you’ll know why you would want to prevent it. Shingles can cause severe and long-lasting pain. While the shingles rash typically resolves in about a month for most people, the pain is very difficult to treat. Other symptoms include fever, headache, chills, upset stomach, muscle weakness, skin infection, scarring. 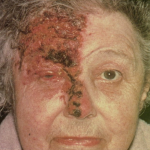 Shingles can also develop in the eyes and cause vision loss. Additionally, in about 10-18% of cases, patients will suffer with postherpetic neuralgia (PHN) which is a condition best described as a lingering, burning, stabbing, throbbing, or shooting pain that can last weeks, months or even years. So with one mom down with shingles, her daughter grew concerned over the arrival of her new baby. Would it be possible for her newborn to contract the virus? Fortunately, people don’t catch shingles from other people. Rather, shingles (also called herpes zoster) is caused by a reawakening of the varicella zoster virus (VZV) that causes chickenpox. After contracting chickenpox, the virus lives in the nervous system for years – even decades – until something causing it to reawaken. Sometimes it’s reawakened by a waking of the immune system from advancing age or immune-suppressive drugs used to treat cancers. But what’s hardest to accept is that most cases of shingles occur among adults who are otherwise healthy. Even having suffered with shingles doesn’t prevent someone from having it again. 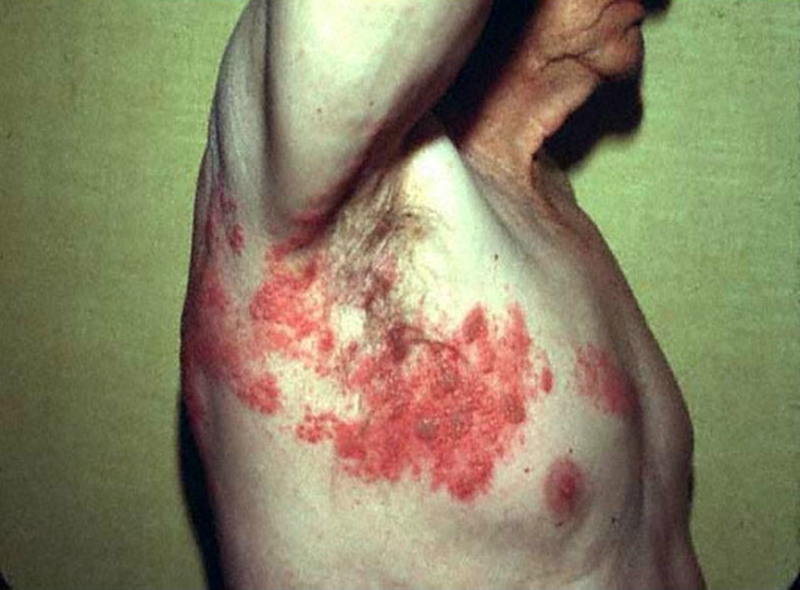 In fact, a reoccurrence of shingles happens in about 6% of people. In the case of the mother and pregnant daughter sharing a home, the possibility existed that the newborn baby, too young for varicella vaccine, could potentially be at risk of contracting chickenpox if she were to come into contact with the rash of the infected grandmother. This is why the family was advised by their doctors to be extra diligent in washing hands after touching any of the open sores. While there are verified cases of shingles in people of all ages – even adolescents – the risk of shingles appears to peak in those age 65 and older (as seen in the chart at left). 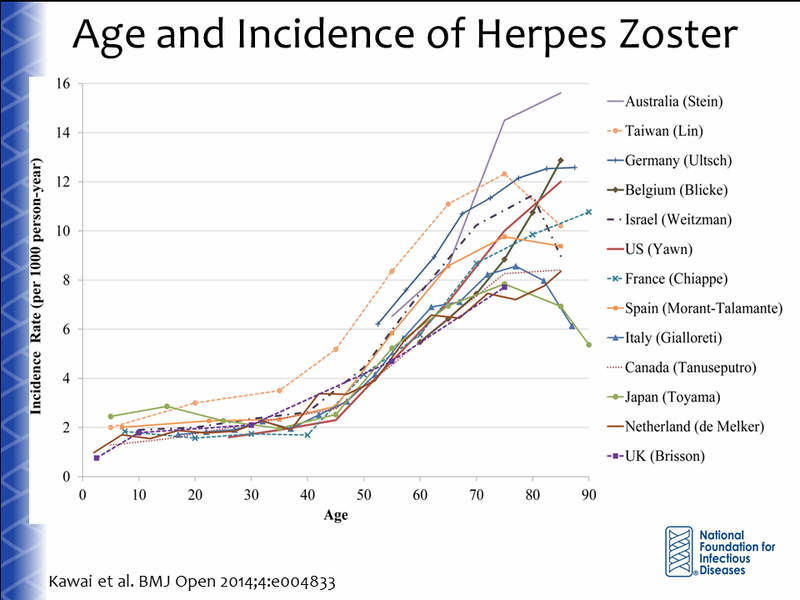 So, while scientist have been observing an increase in the incidence of zoster since 1993, they attribute the rise in cases to an aging population as well as a population who is increasingly immune compromised. To complicate matters further, experts explain that the epidemiology of zoster has been changing and it’s unclear exactly why. The current vaccine, which we know to have poor efficacy in the high risk elderly, also does not provide long-lasting protection. However, it can reduce the risk of shingles by half (51%) and reduces the risk of prolonged pain at the rash site by 67%. When shingles vaccine was first licensed in 2006, it was approved for use in people age 50 and over. In fact, the research at that time determined that the shingles vaccine had a 70% efficacy among people ages 50-59. However, the efficacy was reduced when administered to older individuals, and protection continued to decline significantly at 5-10 years post vaccination. So, when the Advisory Committee on Immunization Practices (ACIP) announced their adult vaccine recommendations in 2008, they recommended one dose of shingles vaccine be administered to adults at age 60 and older. Their decision was based on the belief that vaccine administrations should be timed to achieve the greatest reduction in burden of disease and the related complications. 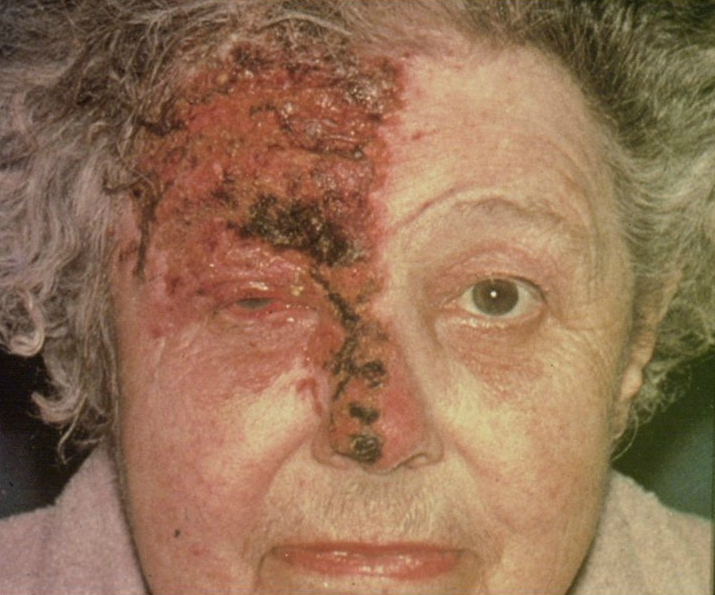 Since there was insufficient evidence of long-term protection offered by the zoster vaccine, it was believed that vaccinating persons under 60 years of age may not help protect people when the incidence of herpes zoster and it’s complications were at their highest. While it appears that there has been a downward trend in childhood cases of shingles since 2005, most likely as a result of increased varicella vaccination among children, current shingles vaccine uptake among adults 60 and over is lower than most other adult recommended vaccines at just 27.9%. If uptake were greater it is suspected that we would be seeing fewer cases. In looking ahead, we are hopeful that two new shingles vaccines will prove to be more effective. groups over 50. 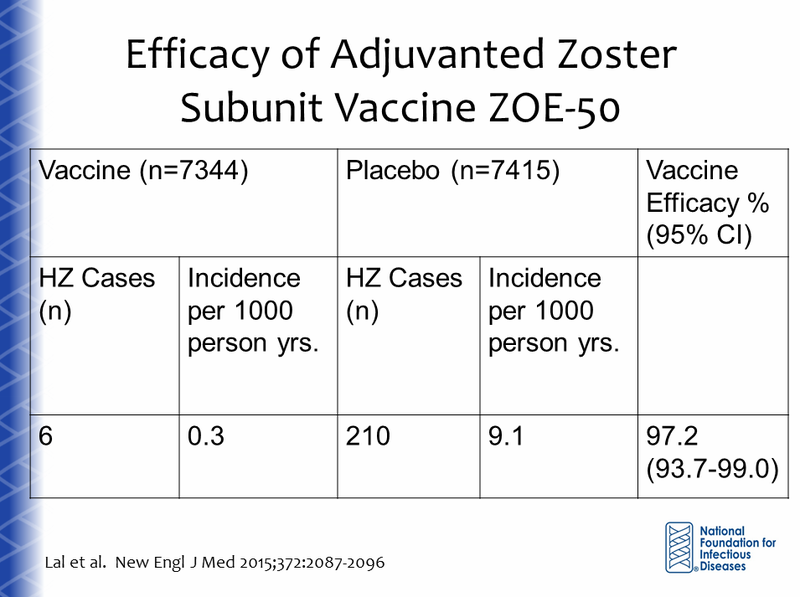 And the most recent data from a Phase 3 trial, published Sept 15, 2016 in The New England Journal of Medicine, indicated that “two doses of HZ/su vaccine administered 2 months apart had a vaccine efficacy of 89.8%, as compared with placebo, in reducing the risk of herpes zoster among adults 70 years of age or older. A similar vaccine efficacy in reducing the risk of postherpetic neuralgia was shown in the pooled analysis”. As we wait for these two new shingles vaccines to come to market, it is important that we continue to encourage adults to take the preventive measures that are available to them today. The current shingles vaccine is the best way to reduce your chance of developing shingles. If you do get shingles after being vaccinated, chances are it will help reduce the effects of long-lasting pain. 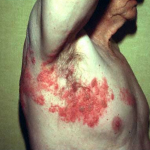 Even if one has suffered with shingles in the past, this does not prevent them from getting shingles in the future, and it is recommended that they wait at least a year (during which time a patient will have a natural boost in immunity) and then get vaccinated to help prevent future occurrences of the disease. We recommend that all adults over the age of 60 talk to their doctors about shingles vaccination. For more information about shingles disease and vaccines, please reference the following resources, most of which have been used in developing the content of this article. Shingles Vaccines: What You Need to Know May, 2016, Kenneth E. Schmader, MD, Professor of Medicine and Chief, Division of Geriatrics at Duke University Medical School and Director, Geriatric Research, Education, and Clinical Center at the Durham VA Medical Center discussed the importance of shingles vaccination in older adults. To access this archived webinar click here.